How in the world is it November already? Yesterday I took a study break at Starbucks to refuel before even more homework and they already had their red cups out. I definitely wasn't expecting that. I feel like I haven't even been able to fully appreciate fall yet and now we are running full force to Christmas. It's crazy! Now that the leaves have all pretty much changed to their fall hues and have begun to fall here and the weather is starting to remain slightly more consistent I thought it would be fun to share some pieces with y'all in one of my favorite colors for fall, green. Whether we are talking olive green or hunter green I really don't think you can go wrong, especially in the fall. Maybe it's just because I have green eyes but I think there is something about the color that really makes a statement. 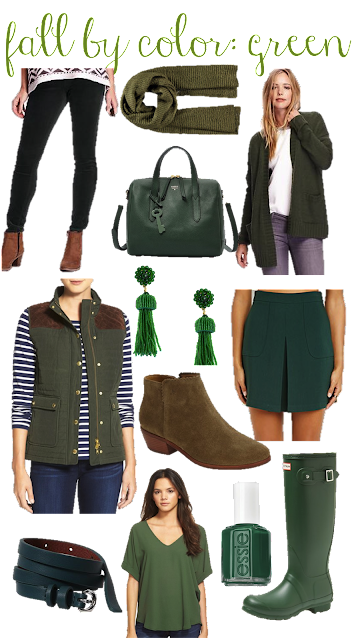 It's almost like the fashion world asked my opinion on the matter since I've been seeing so many shades of green in great fall pieces all season long. On my wish list when it comes to green items? A pair of hunter green jeans. Perfect for now and great to wear well into the holiday season as well! Although with one item to hunt for I happened to find too many other great items that it would be selfish for me not to share them with you, right? You can shop the pieces above and some other great pieces that will leave your friends green with envy (humor me and pretend you laughed at that one) below by clicking on the item! A couple of the items popped up in a different color but the image should still lead you to the item in green as well! Those tassel earrings are seriously everything, love them! There are cases when people buy a copy in addition to original wristwatch. They use the first one quite often while the latter is held in their safe and are worn only for really great occasions. Truly exceptional Replica Panerai Watches are perfectly made so that even experts can't tell them from originals. You are sure to wear these reliable timepieces with pride and elegance every day. It goes without saying that replica watches are one of the best ways to buy preeminent accessories without wasting too much money. It is time to perfect your style! The Knockoff Rolex Watch are guaranteed in quality, payment and shipping. Professional customer service and after sale service make you rest easy! Welcome to buy! It could not be better for you to wear Copy Patek Philippe Watches when you're attending a party or other occasions, wearing a nice watch will emphasize your high grade taste.